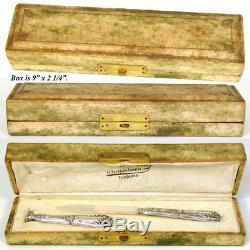 Antique French Sterling Silver Box Writer's Set: Pen, Letter Opener & Wax Seal in Box. All items and photos are the express property of Antiques & Uncommon Treasure. No reproduction without prior written consent. We'll be sending out sale notices and special deals to our'Favorites' customers. 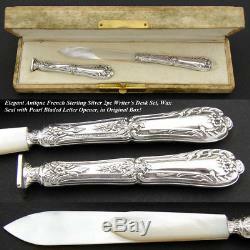 Elegant antique French sterling silver 2pc writer's desk set including wax seal or "sceau" and mother of pearl bladed letter opener in the original fitted & marked storage and/or presentation box! 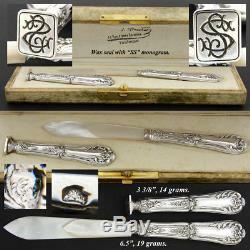 1900 (give or take 10 years) French writer's desktop set in fine old French hallmarked silver with each handle bearing the Minerve or Minerva control mark meaning it's guaranteed to be. A tiny boar's head hallmark on the seal tip itself meaning it's in. 800, or 80% pure, silver. 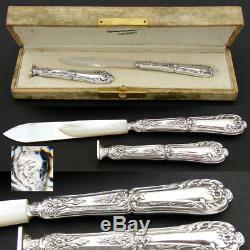 The set appears to never have been put to use, all in fabulous condition with solid mother of pearl knife on the letter opener. 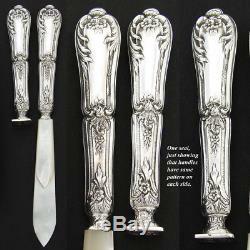 The silver handles also with an ornate Louis XVI style tableau of flowers, acanthus curling around the top and tiny seashell shaped finials. The box is a bit aged on the exterior but fully intact, the inside of the lid bears an embossed stamp that reads Horlogerie Suisse, J.
Plauchatz, 14 Rue Alsace Lorraine, Toulouse. No damage whatsoever that I can see to either writer's implement. See pictures for all measurements. We're easy to deal with. Our fine inventory is very important. And your ranking of our performance is also very important! We wish to keep our 4.9 - 5 star ratings in all categories. We always insure our items BUT, more importantly, pack them extremely well knowing that most are not replaceable. Please remember that when leaving DSR ratings. Icon here or above to see more of our inventory, offerings and venues. We have a HUGE assortment of the finest antiques to be found online, all at your fingertips with Antiques & Uncommon Treasure. _gsrx_vers_631 GS 6.9.8b6 (631). 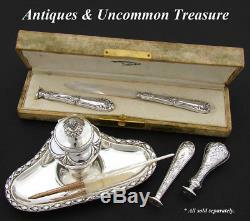 The item "Antique French Sterling Silver Box Writer's Set Pen, Letter Opener & Wax Seal" is in sale since Friday, October 5, 2018. 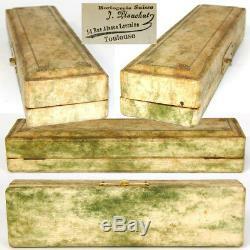 This item is in the category "Collectibles\Pens & Writing Instruments\Desktop Items\Stamps & Seals". The seller is "antiquesuncommontreasure" and is located in San Marcos, California. This item can be shipped worldwide.